Elizabeth Jennings (1926 - 2001) was born in Boston, Lincolnshire. Her family moved to Oxford when she was six, and she remained in the city for the rest of her life. To the old stories of Diana and Eurydice. And where we must be both Theseus and Ariadne. Always it was the half-seen, the just-heard that enthralled. Jennings' work pushes beyond dogma towards regions behind and beyond our Maya of verbal/written formulations and constructions. Jennings drinks straight from the source - the archetypal wellsprings, which pour forth the 'choice and master' themes, words and pictures of our imaginations. In Alan Garner's novel, Red Shift, the action unfolds in the same location but at three different points of history: Roman Britain, the English Civil War and the early 1970s. 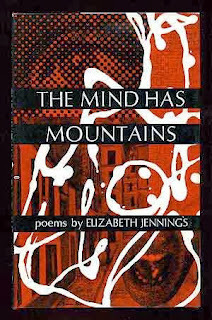 Jennings' poetry gives a similar impression of belonging to both here and elsewhere - yesterday, now and always. It posesses a depth of texture and richness of tone that - like all true art - conveys the sense that our lives are more nuanced, multi-layered and freighted with possibility than the daily grind would sometimes have us believe. But we have to pay a price. With depth comes darkness. Araidne's thread ushers us into the labyrinth. A mental breakdown in the early 1960s brought Jennings face to face with the 'heart of darkness' in herself and the world. And out of this 'dazzling dark', the voices of the great Spanish mystics - John of the Cross and Teresa of Avila - spoke to her with an authority and resonance authenticated by the pain and crushing loss of the dark night of the soul and spirit. The lives and writings of these two Iberian saints highlight the agony and also the vitality of this Via Negativa - this purging of the mesh of images and desires that lock us into our small selves and keep us alienated from the true gold lying on the far side of despair. This is difficult for a poet like Jennings. Paradoxical too. Because, to a tremendous extent, she relishes and revels in the whirl of images. She thrives off the forms, figures and energies triggered by the free play of human imagination. This is no bad thing. In a world forever plagued by the dead hand of fundamentalist literalism, the balance she strikes, like C.S. Lewis, between the religious and the mythological is a sterling example indeed. But she doesn't leave it there. She goes further. Much further. She's not content to stay there. Not at all. She presses on - one, two, three steps beyond - beyond madness, beyond idols, past projections, severing the web of wish-fulfillment and self-promoting fantasy. It was by negatives I learned my place. Despair returned, but now it danced, it danced.